Be sure to check out our resources page for your event! Seedy Saturdays are a remarkable phenomenon. They are not one event, but a series of separate events, which have sprung up across the country, each individually and uniquely organized under the same general themes of encouraging the use of open-pollinated and heritage seeds, enabling a local seed exchange, and educating the public about seed saving and environmentally responsible gardening practices. What makes a Seedy Saturday (or Sunday or anyday)? Seedy Saturdays have mainly been organized by individuals and community groups who see a need for gardeners, vendors and organizations to have a low-cost local venue where they can learn from one another, exchange ideas and seeds, and purchase seeds and plants. Gardeners, seed companies, nurseries, gardening organizations, historic sites, and community groups have banded together of their own volition to represent themselves under the umbrella of this unique educational and promotional vehicle, not for the commercial benefit of any one company, group or individual, but for the benefit of all participants: visitors, vendors and exhibitors alike. Each Seedy Saturday event is different, because each grows from the effort and ideas of local volunteers. This diversity allows Seedy Saturdays to make the best use of local resources, tailor to regional interests and meet the needs of local audiences. Canada is a diverse country: every Seedy Saturday deserves to be different. Who can host a Seedy Saturday? Anyone and everyone! 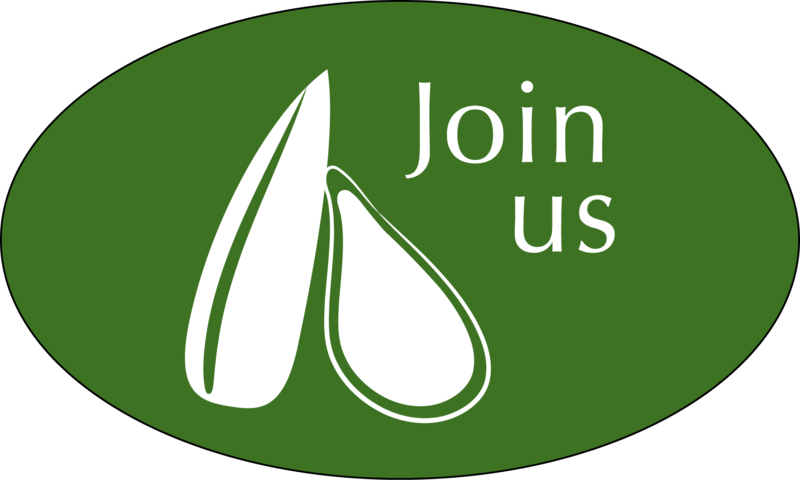 Seedy Saturdays have been hosted by individuals, volunteer committees, established public sites, churches, gardening groups, non-profit organizations, farmers, and others. Seeds of Diversity does not organize or host individual events, but helps with event promotions and supports local organizers in a variety of ways. As a non-profit gardening organization, Seeds of Diversity is pleased to participate as a regular exhibitor at all Seedy Saturdays, providing that we can locate volunteers to represent us. Visit seeds.ca/Seedy-Saturday/organizers. First, identify the various groups in your area who work with seeds. These can include university plant or pollinator scientists, members of Seeds of Diversity, botanical groups, local organic groups, local wildflower societies, local seed companies who sell open-pollinated varieties, historic museums with heritage gardens, local seed-savers, garden clubs, and so on. Find out who the contact people are, and ask if they would help organize an event. If not, ask them to come as an exhibitor or speaker. Some committees meet quite regularly for months leading up to the event, the others divide tasks and work more independently. In any case, make sure everyone is clear on the budget and agreed on the tasks and timelines necessary to pull the event off smoothly. Having a post-meeting within 2 weeks to discuss ideas for the following year while they’re still fresh can be a big help with future events. Appendix D features a sample treasurer’s report. Most Seedy Saturdays are held January-April, giving seed savers time to process and package their seeds from the previous year, but before gardeners need to start seeds for the upcoming growing season. Coordinate date scheduling with other Seedy Saturdays in your region so vendors don’t have to choose between events to attend (some vendors will travel <500km for a larger event at which they could have sales). Check events at www.seeds.ca/events. You can see this year’s events, but also you can change the drop down box to show last year’s events, to see when all events took place (we often don’t know all events until later in the season). Do you want to include seedling vendors? If so, a later date may work better. In many Canadian climate zones, some seeds need to be started indoors by February or March so earlier dates will better accommodate seed sales and swaps. Watch out for Easter, Stanley Cup weekend or conflicting events in your community. Seedy Sundays can work too! Choose the venue before the date, it’s easier to vary the date than be disappointed when you can’t find a venue on the date you’ve already chosen. Most events are held from 9:30 or 10 a.m. to 3 p.m. Vendors have stated that attendance usually drops significantly after 3:00 and they like to have time to pack up and travel home. Some smaller communities try to link their Seedy Saturday with a location such as a library or farmer’s market, which brings people out. Others choose locations because they are free, pleasant, a good size, or centrally located. Often organizers have co-sponsors who own a hall which becomes a natural venue for the event. Exhibitors don’t get as much exposure if they’re in a separate room from the seed exchange and vendors. Try to book a hall with a large enough room for everyone to be together. Workshops, speakers, videos, food space, children’s area, etcetera can be sited in separate rooms. They suggest that radio ads are most useful within the last seven to ten days prior to event, and live interviews provide the most info. Choose someone with a broad knowledge of all aspects of the event and a good speaking voice. They also suggest that you try to get an article written by a freelance writer or an on staff writer on the reasons why Seedy Saturdays are being held, this year's theme, and a special feature or speaker. If you have the funds, run an ad at the same time elsewhere in the paper. If you wish to take advantage of Seeds of Diversity's national publicity, please notify mail@seeds.caas soon as you know your event date. This information can be brief—time, date, venue, city, province. Updates can be sent in later - we post detailed information right up to the date of the Seedy Saturday on our website. This is really the heart of a Seedy Saturday event. The exchange facilitates the trading or purchasing (for a minimal donation) of seeds saved by local community members. Most organizers have found that their seed swap areas – even if completely unsupervised – are rarely abused. That said, having a volunteer or two at the table can greatly help improve its organization! Get the word out ahead of time that seeds should be packaged and clearly labeled with the type of seed, year saved and ideally the # of seeds included in each package. Any extra information about the variety and where it was grown are great! Create different tables or zones for the different types of materials expected (e.g. seeds, rhizomes, plants) and perhaps further subdivide seeds into smaller categories such as tomatoes, beans, other vegetables, flowers etc. Use lots of signage – if possible, place them up above head level so participants can easily read them even if there’s a crowd. Be prepared to provide lots of bags and boxes of different sizes for the public to carry away their new materials. Use envelope boxes to hold the seed packages upright rather than just scattering the packages on the table. If a label showing the type of seeds in each box is placed both on the front and back of the box, then volunteers can replenish the seeds without removing the box from the table. In Winnipeg, seeds are spread out according to type--perennials, annuals, herbs, and vegetables. People are given a ticket for each packet they bring in and can exchange the ticket for another packet of seed. A smaller community can afford a seed exchange with a greater spontaneity. Many organizers found that the first year they held this event, few people brought seeds to swap, so don’t be discouraged if the exchange doesn’t take off right away! Most events invite a variety of local organizations and non-profits to have tables at their event. This can be a great way to add educational value, create more local investment, and help attract attendees. Consider inviting organizations of an organic, horticultural or ecological nature to have tables at your event. Keen organizations may even become partners - helping with promotions and finding volunteers. Sometimes non-profit exhibitors are asked for a donation or charged a nominal table fee (usually $10-30). Not all Seedy Saturdays include vendors, but including vendors can certainly help boost community interest in your event. Some events do not have any selling of seeds, choosing to keep all the focus on the seed exchange. Will you ask for an advance deposit to hold their spot? Will you charge a table fee? If so, a flat rate or a percentage of sales? When can they set up? When do they have to tear down by? Write up an agreement so everyone is clear on fees and expectations. You may want to consider having all exhibitors and vendors sign waivers, in the unlikely event that their materials or goods are damaged or stolen, or one of their representatives is injured. See Appendix A for some ideas of exhibitors and vendors to invite. Appendix B is a sample letter to invite potential vendors. Some organizers invite local restaurants or local/organic caterers to sell food at their events. Many events invite other non-profits to offer food or host their own Seedy Café or where they sell baked goods or other snacks as a fundraiser. Attendees love being able to buy a snack or lunch, or at least have an area where they can sit and share ideas over a cup of coffee! You may want to invite local experts in various aspects of seed conservation to speak or conduct a workshop. These experts include the vendors at your event and speakers (list available by request). Also consult the list at http://www.seedsecurity.ca/documents/resources/Trainers-List-ENGLISH-08.2013.pdf Appendix C has a list of workshop & presentation ideas. You could pay speakers, waive table fees, give gift certificates or simply ask for volunteers. Workshops often work best run in separate rooms from the vendors and seed exchange. The number of workshops will be affected by how much space you have, how difficult it is to find presenters, your budget for paying speakers, and the number of attendees you expect. The Food Security Network of Newfoundland and Labrador’s “Root Cellars Rock” initiative has developed a series of downloadable food skills workshops at http://rootcellarsrock.ca/food-skills-workshops/ These include detailed outlines for workshops and activities on Seed Saving, Container Gardening and Composting and a number of other topics. You may want to consider having a children’s area with activities running throughout the day. These could include: painting and drawing, planting seeds, seed card/papermaking/crafts, Seedy Jeopardy, seedy BINGO, a scavenger hunt or other games. A local 4H club, church, or school may be able to offer some help. Interactive displays are a great way to engage attendees: Observation hives, seed cleaning displays, seed sorting activities and seed ID games are just a few ideas for setting up interactive activities right on the trade show floor. Most Seedy Saturdays are free or inexpensive to attend. Entry fees generally range from 0-$5, often collected as “suggested donations.” If you’re collecting door fees, don’t forget to bring a sufficient float! You may want to solicit donations for raffles or door prizes. Exhibitors may be willing to donate gifts, which can be raffled to raise funds. A coat check can also be an effective fundraiser. 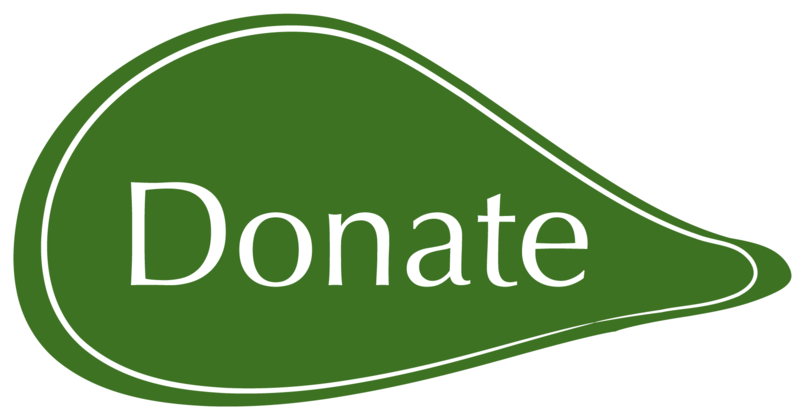 Many events collect donations specifically for Seeds of Diversity or other non-profit organizations, or donate a portion of their proceeds. Attendance at Seedy Saturdays across the country varies from a few dozen to over 2000. Events often grow with time as momentum builds and word spreads. Keeping track of attendance and revenue helps with budgeting and planning in the future. It’s also helpful for Seeds of Diversity to track trends across the country from year to year. Even if no fee is charged, handing out door prize tickets is one way to keep track of attendance. In addition to your organizing committee, you may want to attract some volunteers to help with tasks such as set-up, display staffing, front door, exhibitor hosting, managing the seed exchange table, workshop A/V, and cleaning up. Have a suggestion book on hand that volunteers can write feedback in throughout the event. Contact us at mail@seeds.ca or call 226-600-7782. Seeds of Diversity members may reserve many more items (ask for list) that are available for member volunteers staffing our table or presenting a seminar for Seeds of Diversity. Please make your request for all materials at least 4 weeks in advance of your event and write your mailing address on the request. Please note that many events are taking place in February and March, so book all materials early. When you request anything from us, please state how many of each you want. About 2 months before the event send an e-mail to all the heritage seed companies at www.seeds.ca asking them to mail some copies of their current seed catalogues. At the event, make the catalogues available for people to pick up. This is a very popular idea. WANT MORE HELP OR IDEAS? Visit other Seedy Saturdays! Talk to organizers of existing events. We can help match you with an experienced organizer if you’d like. Contact mail@seeds.ca. This is an invitation for you to take part in a very special event. 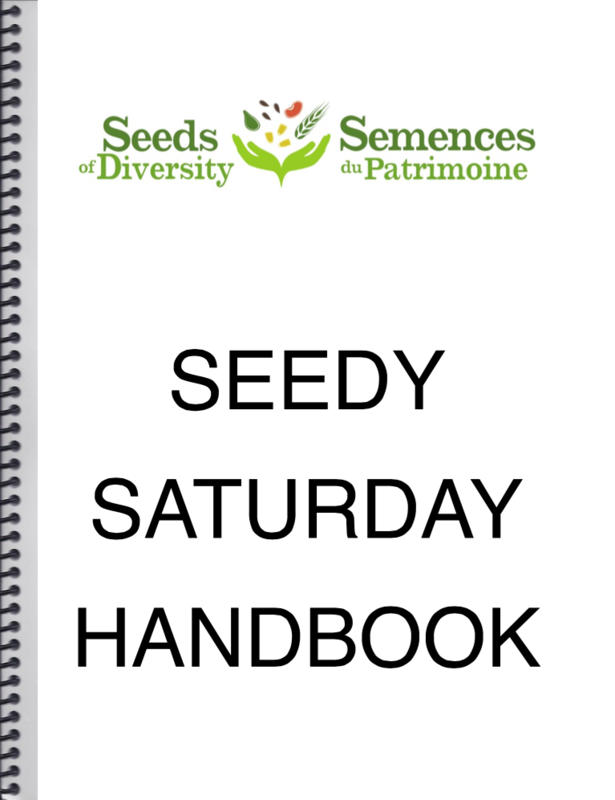 On Feb. 24, 2001, Eco-initiatives and Seeds of Diversity Canada will be holding the first ever Seedy Saturday in Montreal. As you are no doubt aware, the numbers of people interested in gardening and in growing their own food just keeps expanding. More and more, gardeners are looking to have something different in their gardens. They are concerned about genetically modified food and are looking for local, organically produced seeds for their garden. Seedy Saturday will provide the opportunity for those people to come together and buy or exchange interesting and unusual heritage varieties of vegetable and flower seeds. As you are a commercial seller of heritage seed, Seedy Saturday will give you access to gardeners who are looking for exactly what you have to offer. For a charge of $20 we will provide you with a table to display your product. Many environmental organizations will be invited to set up information tables. Music and food stands will add to the festive atmosphere. Seedy Saturdays have been held in other parts of Canada for years now with great success. Our day will take place at the Unitarian Church of Montreal, 5035 de Maisonneuve West on Sat. Feb. 24 from 1 to 4 p.m. If you are interested in participating please let us know by…. We look forward to seeing you there to help us make Seedy Saturday a tremendous success. If you have questions please call or contact [ ]. any seed/plants grown by farmer(s) you do not know are clearly identified as such at your table, in your respective catalogs or on your seed packets. Any seeds/plants you sell considered invasive are labeled clearly as such. Please return this page only to seedysaturday@gmail.com or include with your exhibitor application.